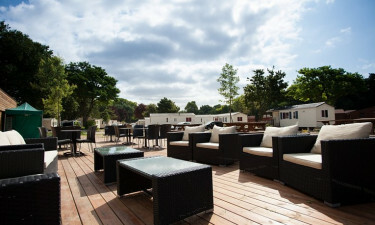 Paris Est-Champigny is a luxury camping site situated just on the edge of Paris and set in large and lovely grounds. In addition to top of the range mobile homes for holidaymakers to stay in, the site features plenty of amenities and facilities for the whole family to enjoy. All of these excellent features combine to make Paris Est-Champigny an outstanding LUX-camp, meaning holidaymakers who want to experience the camping holiday of a lifetime should ensure they book to reserve their place today. What makes Paris Est-Champigny So Special? Paris Est-Champigny can be found just six miles to the east of Paris, which makes it possible to travel to the very heart of the Paris in a mere matter of minutes. Families are also sure to appreciate the close proximity of Disneyland, which is around 18 miles from Paris Est-Champigny. 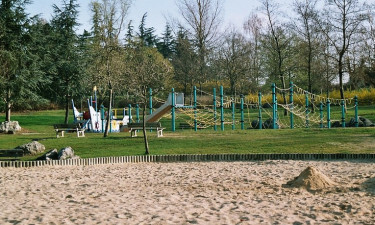 The Tremblay leisure park is just a hundred metres away and this is a great place to relax and unwind on a sunny day, while taking a stroll along the Marne is another experience that should not be missed. The kids will be able to let off a little steam at the onsite children’s play area and make friends with other children while their parents enjoy a little alone time. The site also features a games room that includes table tennis facilities, while rainy days can be spend surfing the internet at the onsite internet terminal. Paris Est-Champigny is a great place to rent mobile homes for extended stay, as there are plenty of other facilities for families to make use of. The site comes complete with both a washing machine and tumble drier, which means that taking care of the laundry is a breeze. The Paris Est-Champigny site also boasts 36 separate washing cubicles, so there should never be any need to queue to use the shower, while the sanitary facilities are also wheelchair accessible. 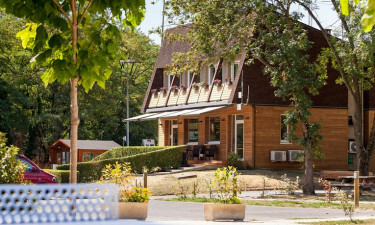 Connoisseurs of great food who want to get the most out of luxury camping at Paris Est-Champigny will find everything they need right on their doorstep. The site boasts a selection of restaurants that serve gourmet French cuisine as well as a selection of popular British dishes. Indulging in a meal here in the evening is the perfect way to enjoy pure pampering, while the onsite snack bar is open throughout the day and evening and is a great place to grab a quick bit to eat before heading out to explore all that Paris has to offer. The onsite grocery shop provides families with everything they need to create healthy and delicious meals that can be prepared and eaten together. This store is stocked with both British and French products that can be used to get busy in the kitchen as well as quick cheats to help make meals a breeze.